From Anonymous of Macon, Missouri on 11/4/2018 . I loved how the author cultivated a strong line of morality and encouraged the reader to view kindness,cheerfulness, unselfishness, etc. in a positive light. It had a very pleasant twist that I didn’t see coming, which one can always enjoy. 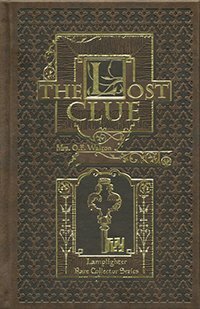 Overall I would highly recommend “The Lost Clue” to anyone, and the recommended age given for it I felt was also appropriate. I was Very pleased with my purchase and grateful to have such a safe book resource as Lamplighter. Thank you! I liked this book because it really is about determination in making the best of the situation you're in no matter how dreary the circumstance. Both of the main characters were forced into less-than-ideal positions, but God works in their hearts and rewards them for their faithfulness. Intriguing. I may read it aloud to my children (18, 12 & 10) or just let them each enjoy it on their own... Either way! From Anonymous of Jacksonville, Florida on 9/6/2018 . After reading Ishmael and Self Raised, I asked for a recommendation of a similar book. This one was recommended. It was great! It did not take long to read because like the other two, I could hardly put it down. It’s a great story of doing the right thing even when you must personally sacrifice to do it. Great ending too! From Sheri Mowery of Cleveland, Tennessee on 4/5/2018 . Great book! I loved the main characters. Marjorie, although she is fictional, is someone who I want to be like. Throughout the book there are important Christian themes. Although the book is not an entire mystery, an unsolved question nags at the main character and when the secret comes out, it is so interesting. I enjoyed this book very much and I highly recommend it. From Heidi of Queensland, Australia on 2/27/2017 . A wonderful story to foster a character of dedication and commitment found in doing one's work as though working for God. Yes.